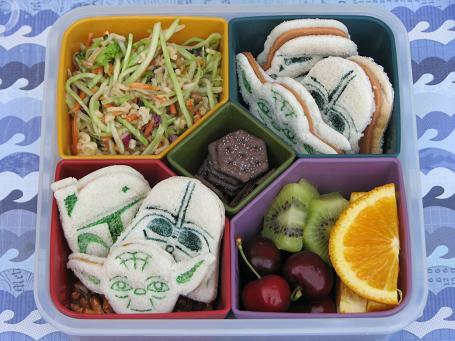 Bento for Kidlet: Star Wars Picnic bento! Today Kidlet had Field Day at school and after it was over there was a family picnic for lunch! The perfect time for me to try out the new picnic sized bento I got in Boston! L-R on top there is broccoli slaw and Star Wars sandwiches with soy ham in the middles. L-R on the bottom there are peanut butter Star Wars sandwiches with pretzels underneath and a container of kiwi, oranges, and cherries. In the little middle compartment there are a few Oreos from a 100 calorie pack. Put the ramen noodles in a bag and crush them with a rolling pin while melting butter in a large skillet over low/medium heat. Add the crushed noodles and slivered almonds to the skillet and saute, stirring occasionally (keep temperature at low/medium heat). Meanwhile, whisk together all the dressing ingredients in a small bowl. Place the shredded broccoli into bowl and toss with the noodles, almonds, and sunflower seeds. Pour dressing over salad and toss to coat. Garnish with chopped green onions. That sounds wierd but really good in the same breath.. I'm gonna have to google whats in brocolli slaw and make this! I love this broccoli slaw-it is delicious! Also I have to get those Star Wars cutters. What a colorful picnic lunch! Me too, love the star wars, and everything looks great in your fab picnic bento. Score! Yoda is awesome. Great picnic lunch, Jenn! What a wonderful picnic lunch! I'm trying to find out what is in the bag of broccoli slaw :) I've never seen it over here in the bag salad section. Is it more then just shredded broccoli? Those sandwiches are awesome! I'll have to try that broccoli slaw, I love broccoli. I have those cookie cutters! My kids love them. How did you color in the faces? I have those cookie cutter and my kids love them! One question, how did you color in the faces ? Food coloring?